The elevator door on the first floor is still shut tight, but you remember jamming it when you were here. You suspect the door to the elevator may still be open on the second floor. You squeeze your raven through the hole in the break room door. You get the raven to maneuver into the ventilation shaft, and have it carefully fly up to the maintenance closet. The door is still off the hinges from when a monster attacked it. You move the raven out into the second floor hallway, and have it fly down the hall to the elevator. You have your raven fly down the elevator shaft to the basement level--specifically, the room where the bio printer was originally kept. You encounter another closed door, leading to the basement hallway and security room. You hear a dull thunk from beneath the floor. Could be the plumbing. Could be anything. This hospital has not been taken care of in a while. I'd suggest the Raven get on the doorframe of the Elevator and prepare to go back up it, if something should appear. Pretty sure that thunk is kind of ominous. If we wait, do we hear it again? ;; Does it seem like (besides the thunking) that this floor is empty, by the way? EDIT: I just realised the door has a kind of glass plating thing. Could we look through it? i vote that if we hear the thunk again we leave. i'm not prepared to sacrifice a bird in order to find out what is banging around down there. What if it's got a great beat? Like... ya know... Daft Thunk. ...Er, er-hrm, right then. Yeah let's be super-careful. I don't think we necessarily need to leave right at the sound of a second thunk, but I do think the bird needs to be ready to GTFO as soon as it catches even a glimpse of whatever might be going thunk in the dark. i just noticed that vasquez's glasses are still there on top of the front of the soda machine. nice touch! What if, instead of something dangerous, it's someone in need of help? While still being ready to take off at a moment's notice, try sending some kind of signal by tapping/pecking on something. i really don't think there should still be anything alive in this place, unless it's like... a rat. or a giant rat. or something worse. the hospital's been out of service and all but condemned for over a month now, why would there be someone here who needs help? also, the thunk came from beneath the floor. the basement floor. there shouldn't be anyone under there, why would there be? it's the basement. Someone else investigating the Tobu attack or leaked hospital footage. but... under the presumably concrete basement floor? Maybe it's Grizwald doing his thing. If there's still power the cameras are still rolling. Whoever's looking at those feeds right now will be mighty suspicious of any raven in the future. Grizwald does seem to be good at infiltrating places. Howler's computer was livestreaming the thing, so unless someone else hacked the thing only those in the sec station would have access. Ravens are omnivores. You have a lot of blood piled along the walls, sure birds are gonna turn up to look if something's big enough to nibble at. I see magpies and ravens eating dead squirrels all the time here. I wouldn't be surprised if scavenger birds dove down to find scraps among the mid and lower levels, then flew back up for the night. If something is still alive after a week, then that means I was both stable enough to live, and had both a mouth and digestive tract. Most of the creations had no sensible organ paths whatsoever, so they would have rotted or died by now. If there was one that didn't it would have been printed later, but the Printer Beast pretty much ate anything that was nearby it. So there is a possibility something survived, but there is also just as much possibility that it rotted into an immobile pile. i've been re-reading the hospital arc again and i think we really should go back here at some point. there's information we didn't get and things we didn't check. we missed a few things on the computer in the operating room, for starters. though if the computer is still working, we might be able to send the raven to it. pecking the right buttons wouldn't be too much of a chore for it. i'm pretty sure it's behind a closed door, though, and the bird might not be able to get in... still, it's an idea. you know. if whatever is banging around down here doesn't decide to turn our little bird into a tasty snack. Did you check to see if we closed that door behind us? Or if it closed automatically? Cause we definitely went through that door, because it's the way from the sec room to the elevator. Good news, you need TWO fingers to open the sec room. The monster ate everyone whose name isn't Finch and mr. Handy the severed hand. So.... we need that hand and Finch to get in there. *phone call* "Miss Immune? Yes, I found the sec room for the hospital, but it needs two fingerprints to open. You know where a Dr. Finch is? I found a hand"
The good news that I forgot to mention was that the files, if they were on that computer ever, are still on there since one of the two required hands (Finch) was never in the building after that. i highly doubt we kept the severed hand. though... we still carry assquez's police badge, so... maybe we did keep it? jane seems to have some kind of weird obsessive desire to loot everything and keep whatever she finds (see, hoarding the masks from the warehouse). if we did keep it, it's probably in either finch's freezer (which would be a nasty surprise for anyone looking to get some ice cream) or michelle's. also, as for the doors closing behind us, swinging doors are a thing. it would make sense for there to be a swinging door on the operating room, since it's easier to get a gurney through than a normal door. if it is a swinging door, then the raven might be able to nudge it open enough to get through? a swinging door also explains how the flesh monster from the operating table managed to get through because i don't think it had the capability to either turn a knob or operate a push bar, either. edit: we haven't actually seen the security room to know if the lock is intact or broken, which means we don't know if anyone has been in it. it's down the hallway that is behind the closed door with the yellow and black markings on it that you can see in the bottom panel. the door also has a push bar, which we've established that the raven can't open. Well, I'd think that the hand is still laying around here somewhere. How much time has actually passed between the hospital adventure and now, anyway? Enough to rot the hand? roughly one month, five days. chapter 2, with fuse, starts a month after the tobu hack. that's more than enough time for the hand to start rotting. in fact, roughly one month after death is where the body has rotted enough to become fluid. though, it depends entirely on the conditions in the basement. warm, humid place, faster decomp. cool, dry place, slower decomp. the presence of animals and insects would also speed the deterioration. if the hand was left down here, it'd be preeeetty gross at this point. that is, if the feds didn't pick it up while they were roving around here. Right. Well, the hand's a lost cause then. Unless someone can rustle up a second person who worked here and isn't dead, that door isn't opening for anyone that can't break it down. If they can afford two fingerprint scanners to lock it, than can afford a really heavy door that won't be easy to break. So while the data might be untouched, we aren't getting in there. why don't we just... go back to the house and take jane's? you know. the one that's sitting on her desk in her bedroom. jane has a computer. she's had a computer this whole time. fuse needs one? then let's go get one. and we don't even need to ask permission, because it's our computer that has been sitting there the whole time and i feel so dumb for not realizing that sooner. Is that a penguin doll thing to the left of it? 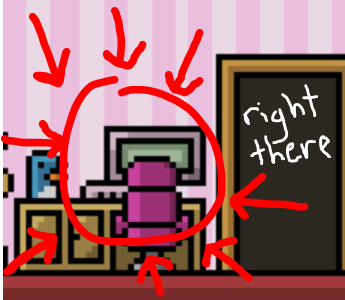 Random thought : How good do you figure Blondie's computer is? I was thinking that it'd be kind of a hassle to carry a desktop computer around...maybe it'd be wise to pawn it and get a mid-grade laptop instead, if we can afford it? Maybe ask Fuse if he thinks the extra juice is worth the loss of portability. As always, use a bird to make sure the coast is clear first, though...could be the feds are watching the place. We have a rat there, actually. So, the bird can go check Howler's once we're done here. we already checked howler's. it looked normal from the outside.